Arrival at New Jalpaiguri Railway Station (NJP) / Bagdogra Airport (IXB) / transfer to Phuentsholling/Jaigaon is 170 kilometres and 6 hours drive from Siliguri-Phuentsholling is in India and Bhutan border-The Indian side is called Jaigaon and the Bhutanese side is called Phuentsholling- Indian Nationals don’t require visa or passport to visit rest of Bhutan but any identity document like election commission I.D card is required-Permit is not required for visiting Phuentsholling only but other parts of Bhutan-Check into the hotel. Evening free at leisure -Overnight stay in Phuentsholling. After breakfast, proceed to Thimphu, (7875ft / 170kms / 06 -07hrs) After two hour drive through light mountainjungle, displaying lianas and orchids, we pass over the first ridge and begin a long and gradual decent to the riverwhich is the source of energy for the massive ChukhaHydel hydroelectric power project. We cross the river andrise up the mountainside ever further into the hills, leaving Chukha and the small town of Chimakothi behind us. Lunch is served en route. On arrival in Thimphu, check in hotel. Dinner and overnight at the hotel in Thimpu. Thimphu, perhaps the most unusual capital city in the world, is the seat of government. This bustling town is home to Bhutan’s royal family. Morning visit to Tashichhodzong, the main secretariat building which houses the throne room of His Majesty, the King.Tashichhodzong is also the summer residence of the Je Khenpo (Chief Abbot) Visit the nearby Institute for ZorigChusum (commonly known as painting school), where a six year training course is given in the 13 traditional arts and crafts of Bhutan. After lunch, visit the National Memorial Chorten. 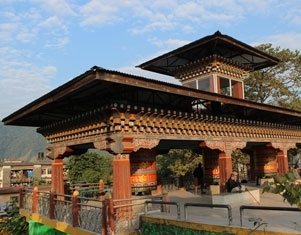 The building of this landmark was originally envisaged by Bhutan’s third king, His Majesty JigmeDorjiWangchuck, Proceed to the national Library, which houses an extensive collection of Buddhist literature, with some works dating back several hundred years, Also visit the Folk Heritage and National Textile Museums, opened in 2001. Overnight at Thimphu. After Lunch (7218ft /55kms / 02hrs).Proceed to Paro. Check in at The valley of Paro contains a wealth of attractions. After Lunch visit Ta Dzong. Once a watchtower, built to defend RinpungDzong during inter-valley wars of the 17th century, Ta Dzong was inaugurated as Bhutan’s’ National Museum in 1968.Take an evening stroll along the main street, and perhaps visit a few handicrafts shops, or take refreshments at a local café or bar, Overnight at Paro. Early morning breakfast - Transfer from Paro to Jaigaon / Phuentsholling - A drive of nearly 180 kilometers, a drive of approximately 6 ½ - 7 hours - After breakfast transfer to Phuentsholing - On the way take a short stop at Chuzom, the confluence of Paro and Thimphu rivers with three different style of stupas adorn this confluence - Drive further through Chapcha and later take glimpse of famous Chukha Dam and the magnificent Vince waterfall before Gedu town - Arrive Phuenthsoling by evening and check into the hotel - Evening free to stroll around the area - Night stay at hotel in Phuentsholing. After breakfast transfer to New Jalpaiguri Railway Station (NJP) / Bagdogra Airport (IXB) Nearly 170 kilometers 4 -4½ hours drive – onward Journey.